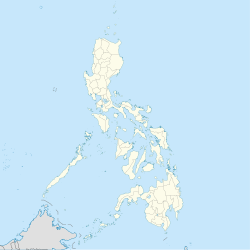 Catubig, officially the Municipality of Catubig, is a 3rd class municipality in the province of Northern Samar, Philippines. According to the 2015 census, it has a population of 33,025 people. Another tale was mentioned that the name Catubig was also a product of a 'word compact' between Americans and Filipinos. It was stated that an American surveyors saw a cat sunbathing by rolling along the grassy edge of the brook. They then approached a young lady who was doing her laundry and asked, “What is that, cat?” The lass, hardly seeing the cat which was in higher elevation, and not knowing what the foreigners were asking about simply responded, “Tubig,” meaning the water of the brook. During the Philippine–American War, Catubig was the scene of a battle between the warays and the Americans known as the Siege of Catubig. The Siege of Catubig was fought for four days beginning April 15, 1900. Catubig is politically subdivided into 47 barangays. ^ "Province: Northern Samar". PSGC Interactive. Quezon City, Philippines: Philippine Statistics Authority. Retrieved 12 November 2016. ^ "Province of Northern Samar". Municipality Population Data. Local Water Utilities Administration Research Division. Retrieved 17 December 2016. ^ "Catubig, Northern Samar : Average Temperatures and Rainfall". Meteoblue. Retrieved 6 January 2019. This page was last edited on 24 February 2019, at 09:08 (UTC).